Primary library: package:apps_script_tools/main.dart with components: io. line 26 col 49: Use = to separate a named parameter from its default value. line 37 col 22: The value of the local variable 'directoryEvent' isn't used. line 69 col 18: The value of the local variable 'event' isn't used. line 28 col 52: 'allowMultiple' is deprecated and shouldn't be used. line 49 col 3: Future results in async function bodies must be awaited or marked unawaited using package:pedantic. line 71 col 40: 'allowMultiple' is deprecated and shouldn't be used. line 102 col 3: Future results in async function bodies must be awaited or marked unawaited using package:pedantic. Common filename patterns include main.dart, example.dart, and apps_script_tools.dart. Packages with multiple examples should provide example/README.md. 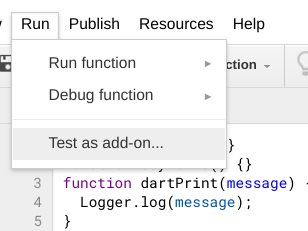 Tools for using Dart programs as Google Apps scripts.